Orange, one of my favourite fruits, begins to be in season here finally. I often like to use navel oranges to make savoury dishes. 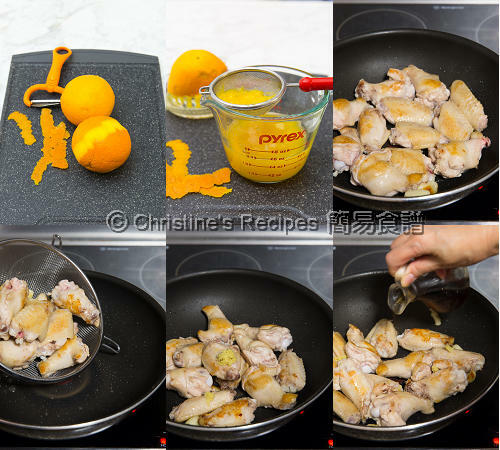 Both of the acidity and sweetness of an orange are magic to balance the taste of a chicken dish. Although the sweetness of each orange is quite different, this recipe is very forgiving. A bit of sugar or lemon juice will be well enough to adjust the taste of the dish. It’s downright easy. You won’t be wrong as long as you remember to taste before it’s served to your family. 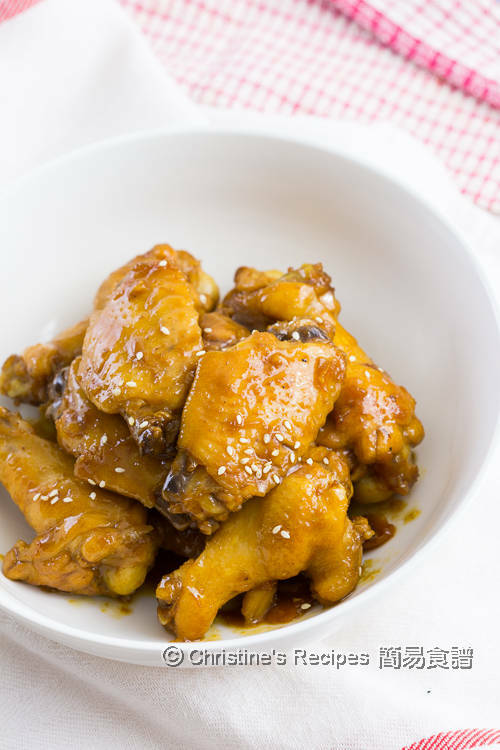 The glossy delicious orange sauce makes the chicken wings so finger-licking good. It will make you want more. This dish can be served as a snack or a main served with salad or steamed rice. Rinse chicken wings and wipe dry. Set aside. Heat oil in a frypan over medium high heat. Saute garlic. Add chicken wings. Pan fry until both sides are lightly brown, releasing some oil. Discard the excess oil, leaving about 1 tablespoon of oil in the fry pan. Sprinkle wine. Stir in grated ginger. Pour in light soy sauce, orange juice. Add sugar and orange strips. Cover and cook until the chicken wings are cooked through. Remove the lid. Continue to cook and reduce the sauce until thickened, about 25 minutes. Stir in honey. Remember to taste. If you're satisfied, it's done. If necessary, season with salt and lemon juice. Done. Serve hot. Use a fruit peeler or a sharp knife to peel the orange rind. Don’t use the white part anyway. It tastes bitter. The orange zest is to increase the fragrance of this dish. Chicken wings will release some water while cooking. 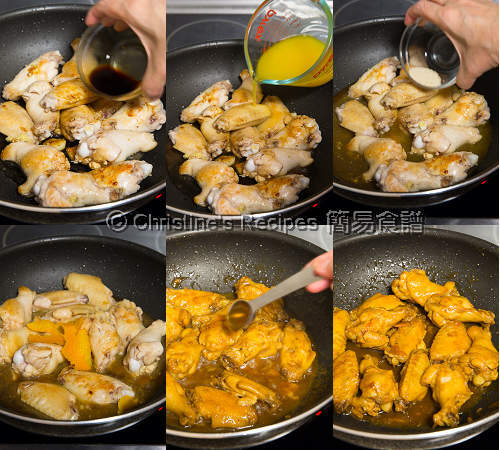 By cooking with a lid, it will speed up the cooking process and get the chicken wings cooked through easily and quickly. Continue to cook without a lid on, as you want to reduce the sauce until about ¼ left. The sauce will become thickened and taste more delicious. I love the pairing of citrus and chicken too. 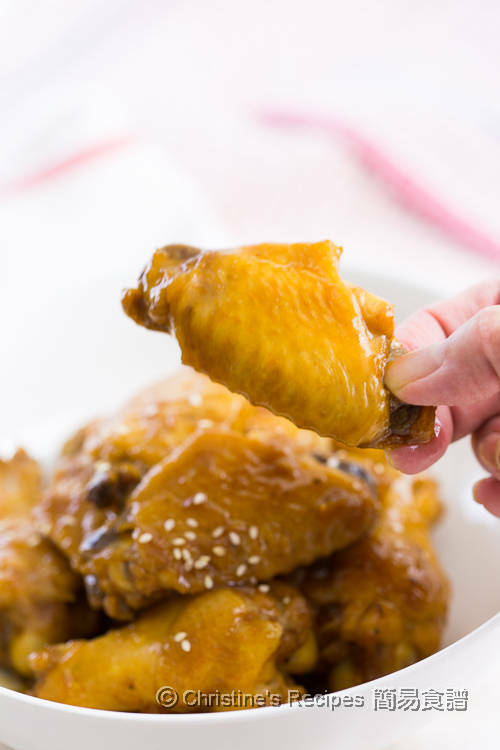 This chicken wing recipe looks so appetizing!